Be-Bop with SUU’s Department of Music Jazz Ensemble at 7:30 p.m. on Thursday, November 16, 2017, in the SUU Music Building’s Thorley Recital Hall. Music will range from big band to contemporary jazz and promises lively rhythms and soulful compositions. Admission is free and open to the public. The Jazz Ensemble will be playing When You're Smiling by Tom Kubis, featuring Johnny Rhur on Tenor Sax. Minuano by Pat Metheny, featuring Logan Wilson on Trumpet, Bebop Charlie by Bob Florence, Hear of the Matter by Bob Mintzer, with solos by Robby Debry, Trombone, Hayden Eighmy and Chase Woods, Alto Sax. The music of Pat Metheny has a sound that is unique, contemporary, and reflective of a newer generation of Jazz artists. Lloyd Peterson from the Scarecrow Press Book felt that, “the creative genius of Pat Metheny lies deep beneath the surface, a place of heartfelt passion and beauty, of melodic depth and spirit.” His music feels both effortless and innovative. Let your inner rhythm sing as you bop with the SUU Jazz Ensemble. 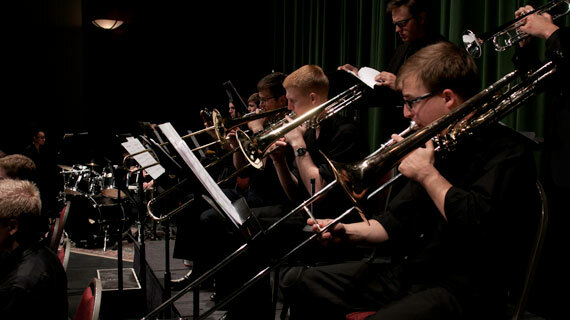 For more information on SUU’s music department, please visit www.suu.edu/pva/music.